In the ancient blogging tradition, I am accepting “donations” from you in support of this blog. A donation is a one time payment from you which would go towards the cost and upkeep of BlogInSong.com. A donation can be in any amount and, by all means, think big if that is your lot in life, and your nature. If you are a super-fan and just can’t get enough of this blog, or you have lots of money, or you are my Great Aunt, please visit my Store. From there, you can purchase individual songs (many of which are not posted on my blog) or you can become a subscriber. This is how I make my living, and your direct help makes it possible for me to write as I please without the influence of any middle man or woman. With your subscription, you receive lots of great goodies. Full details can be found on the Store page! I will be sending 5% of all donations made to this blog to a charity which is very close to my heart. Please read on for more information. Thank you for your support! These are my two amazing children. Their first school pictures captured their personalities with strange accuracy….El Destructo, as we call him, is always wide eyed, interested, participatory. Little Sunbeam, as we call her, is intense, searching, whip-smart. 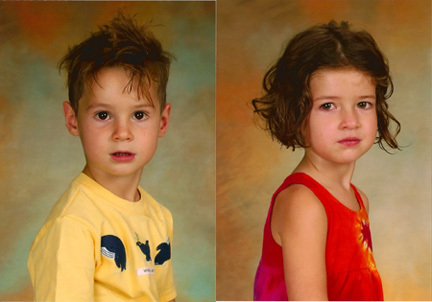 They are three years old, twins, happy and wild. On September 11th 2009 the whole family ended up in the Emergency Room with Little Sunbeam. She was diagnosed with Type 1 Diabetes. Since then we have begun to adjust to the daily finger pokes (at least 4) and shots (at least 3), the carb counting and the additional vigilance required of a family that is living with Diabetes. Its hard. But its not cancer and we have a lot to be thankful for. The thing we are most thankful for is the Barbara David Pediatric Diabetes Center in Denver Colorado. We count of them to guide us every step of the way, and the guidance they provide is priceless. All of the staff have been kind, gen erous with their time, sincere with their concern and easy to understand. You know already that I have a lot of causes that I care about, but this one has obviously taken the lead in my life. The Barbara Davis Center turns no patient away for lack of funds. So, this small amount that I am able to give is only a gesture, but we all have to start small right? By the way, most experts think there will be a CURE for Type 1 Diabetes in Little Sunbeam’s lifetime. Thank you for your donation.